DEBORAH CROMBIE: What fun to have MARK PRYOR, our Jungle Red friend who is English, lives in Austin, and writes books set (mostly) in Paris. I'd call that a real cosmopolitan guy, and I love his character, Hugo Marston. Lucky for me I got to grill Mark about his new Hugo novel, THE SORBONNE AFFAIR. This series is one of my very favorites of the last few years, and I can't believe this is the seventh book already! DEBS: In some ways this book seems an homage, both to the classic mystery and to the espionage novels of the mid-twentieth century. Even the title, The Sorbonne Affair, made me think of books like Helen MacInnes's The Venetian Affair. Were you inspired by that era, and if so do you have favorite authors or novels? MARK: That’s the era I grew up in, reading books that were both espionage and crime thrillers. Living in the English countryside, it was an exciting way for me to see other parts of the world, and to learn more about the Second World War, which has always fascinated me. I was reading a lot of domestic mysteries, too, though, like Agatha Christie and the Sherlock Holmes, so I suppose it’s inevitable that my own novels reflect streaks of all of that. As far as favorites, the authors themselves are different these days but the genres and topics are not. Right now, Philip Kerr is an author I admire and enjoy, as is Alan Furst. And what do they write? Mysteries and spy stories set during the Second World War...! MARK: Thank you, Debs, and it’s a struggle for sure. Every year I have to make the trek to Paris to ensure I’m not missing out on anything, slogging my way through pastries and patio gardens, dragging my weary carcass along boulevards and into parks... but who else is going to do it for me? I’d never ask that of someone else. My wife is kind enough to brave these trials and tribulations with me, so there’s that, but I try to remain cheery as I sip café and wander through Paris’s idyllic cemeteries (idyllic, I suppose, if you’re not a permanent resident). You know, a couple of years ago a friend of mine gave his wife one of my books, and as a result she insisted they visit Paris. He was actually a little put out, as it wasn’t his first choice. But he’s a kind man and a good husband so he relented and they went. On his return he sought me out and gushed about how they were now doing everything in their power to move to Paris! I was delighted, of course, and every time someone feels, sees, or tastes a little bit of that beautiful city in one of my books it makes me so happy. So thank you! MARK: Not especially but it’s interesting to me that one of the themes of the book arose entirely organically. Hugo, the broad-minded and non-judgmental fellow that he is, repeatedly finds himself being called a snob, something he would rail against. But it’s true, because despite himself he’s surprised to find so many of his friends and colleagues enjoy a good romance novel. I think this has sprung from a pet peeve of mine, which is people drawing lines around genres and then looking down their noses—we’ve seen it several times in the past year when certain writers have been snotty about crime fiction. I won’t name any names, but the idea that because a book contains a crime, and maybe its solving, the story automatically becomes less worthy is laughable. But the same is true of other genres, like sci-fi or romance. I suppose The Sorbonne Affair is a chance for Hugo to be challenged on this point, and it was rather fun for me to prick him with his own prejudice. DEBS: Your transgender French police officer Camille Lerens is a major character in the book. We learn a little, along with Hugo, about her transition process. Was Camille inspired by a particular person? MARK: Camille has become more and more real and important to me, for quite a few reasons, and while she was not inspired by any one individual I think it’s desperately important that (especially white, male, privileged) authors create novels that reflect the world around them, not just the bubbles they’ve lived in. My early books are quite white and vanilla, which is okay to a degree but it’s not where we live. The world is full of people with different skin colors, sexual orientations, gender identities, and while some people may not like or understand these differences, it remains true that they exist. And books should include all these experiences. To be clear, I didn’t create Camille as some sort of political statement, not at all. She’s there to reflect the real world because there are thousands and thousands of Camilles out there, and just as many Hugos wanting to better understand her, just as there are thousands of people who don’t care to. The bottom line is that when authors include likeable, relatable characters who are perhaps in a different demographic, we can confront what we don’t know in a safe way, maybe think a little and learn a little. I don’t know, but I feel like right now the world needs a little more kindness and understanding. Heck, a lot more kindness and understanding, and if one character in one book can be a drop in the bucket towards that, I’ll be thrilled. DEBS: Who else loved those mid-century espionage thrillers? I read that one of Helen MacInnes's books was used as a manual for training British spies during WWII! And would you want to give Hugo a good talking to for being a genre snob??? na. 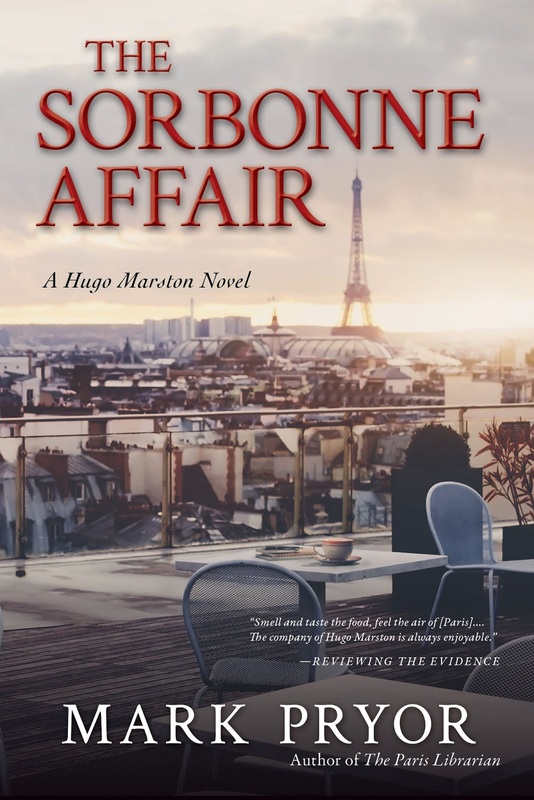 The most recent is ​ THE SORBONNE AFFAIR, a "flawlessly constructed whodunit," according to Booklist. His previous novel in the series was THE PARIS LIBRARIAN, which the Toronto Globe & Mail says “has it all… a finely structured plot that’s one of Pryor’s best books yet.” The first Hugo Marston novel, called THE BOOKSELLER, was a Library Journal Debut of the Month, and called "unputdownable" by Oprah.com, and the series was recently featured in the New York Times. 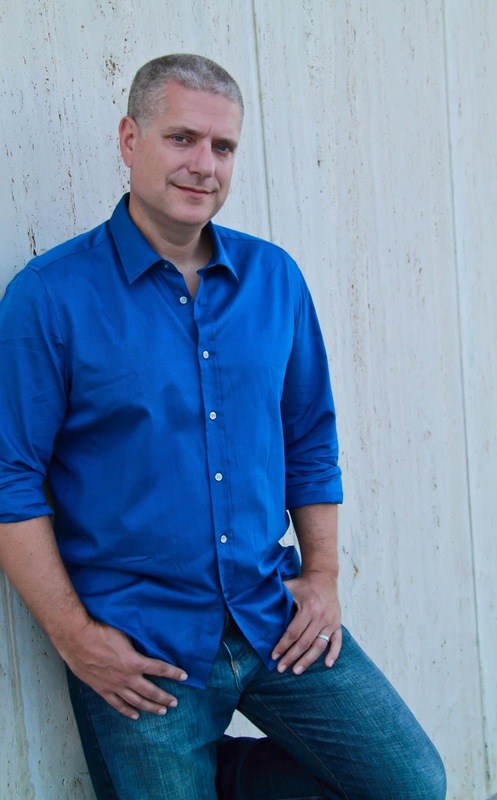 Mark is also the author of the psychological thriller, HOLLOW MAN, and its sequel, DOMINIC, which will be published in January of 2018. He also created the nationally-recognized true-crime blog 'D.A. Confidential.' As a prosecutor, he has appeared on CBS News's 48 Hours and Discovery Channel's Discovery ID: Cold Blood. Happy Book Birthday, Mark . . . it’s so exciting to have a new Hugo Marston novel to look forward to reading . . . .
Debs, I had no idea that one of Helen MacInnes’s books became a spy-training manual. I wonder how she felt about that?? I especially enjoyed reading Helen’s books as well as those of John le Carré . . . . I think “The Spy Who Came in from the Cold” was the first of many George Smiley books that I read . . . . Thank you Joan! Also a huge fan on John le Carre, absolutely. I have the first book in this series. I really have to get to reading it because this does sound like an endlessly fascinating series. I love Paris... love books set in Paris... I'm definitely going to have to read THE SORBONNE AFFAIR. Interesting discussion of writing inclusive fiction that incorporates characters who reflect the heterogeneity of the real world, and doing it well. So much more interesting (and challenging) than retreating into the sameness of one's own experience. I hope everyone loves Paris! At a signing in Houston this past weekend, someone asked me about my transgender character, it really generated a good discussion. And that's one of the many great things a book can do, I think. I still have a slew of Helen MacInnes's books on my shelf--and speaking of different genres, has anyone read her novel 'Friends and Lovers'? Not a spy-thriller, but one of my absolute favorites of hers. No, but I'm going to look it up. Thanks, Flora! Oops pushed publish too soon... Anyway the genre snob discussion is so perplexing to me-what on earth is the goal of that? And yeah, Paris. Is it the light ? The history? The food? The complete totality of chic? It's all breathtaking. Spies in Paris--can't get better than that. My favorite Paris classic--oh gosh too many. But classic thriller? --Day of the Jackal. Hank, I think it's all of it. Paris just has everything. I joke that I'm glad they surrendered so fast in WW2 so none of the buildings were destroyed! Can't wait to read the new book in the series. If I can't be in Paris, reading about it is obvious solution. Hank, I stumbled into the genre wars at a recent writers workshop, where all the agents were looking for "upmarket" fiction, which I learned was a book with literary quality writing and a solid commercial plot. But not (shudder, sneer) genre fiction. I was also told "women's fiction" was upmarket, not genre. So I've become a reverse genre snob: I read mysteries and thrillers for pure pleasure, while I appreciate how good the writing is. According to the Shark herself (Janet Reid), downmarket fiction is unreadable. We are the mystery/thriller/romance genres that dominate the book market as commercial fiction, and proud of it. Well-written, compelling characters, and absorbing plots. Margaret, Deb, Hank: According to two agents I spoke to at a conference this spring, they consider "upmarket" to be any fiction that includes a theme. So beyond the "drunk, divorced cop solves mystery." If you have a theme of redemption, or family, or...anything really, which would include complex, compelling characters - plus an absorbing plot, you are "upmarket." Mary, that's interesting, and makes sense to me. Ooooh. I have theme. Awesome. A friend turned me on to Philip Kerr last year and I've been slowly reading his Berlin books. I wasn't familiar with Mark before, but these books sound like a lot of fun, so I'll be giving them a try soon! Thanks again, Reds, for introducing me to another great author. I think inclusiveness demands that we have genre snobs as well as gender snobs, but we can certainly try to enlighten them. Fascinating author (personal history) and series. I'm in!! I am new to you, so I may ask a dumb question -- what about the English countryside?? Denise, Mark does send Hugo to England in one book! I sure do, in fact I set it in and around the village where I grew up. Hugo has drinks in my local pub and find bodies in the churchyard...all good clean murderous fun! Mark, they changed the cover between the ARC and the final book. How do you feel about that? And happy pub day!!!!!!!!!!!!!!!!! I hope you get a chance to drop in and say hi. For some reason it's making me post as my blog ID, DA Confidential, but here I am! As for the cover, I pretty much trust they know what they're doing. I'm the writer, they can do the book design! Welcome Mark, and Happy Bookday. 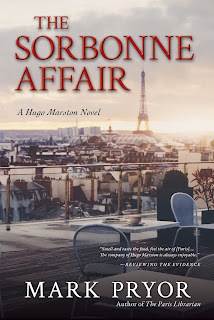 Any book set in Paris intrigues me, and I've just added THE SORBONNE AFFAIR to my TBR pile. Where do you stay when in Paris? In the same place or do you move from one arrondissement to another? Which one is your favorite? Apartment or hotel? Do you get a jambon buerre and retire to the Lux for a three hour lunch? Since you are French, I presume you have no issues with language. Is your French Texas accented? Inquiring minds want to know. By the way, I don't worry about being looked down upon by genre snobs when it comes to what I read. I like mysteries and thrillers so that is what I read. Occasionally, I will read a science fiction novel or a biography of a coach/athlete or a musician I like. But my main focus is the blood, bodies and bullets of my beloved mysteries and thrillers. I have no time for those who would think that only pretentious and self-important / self indulgent reading is the only reading worth doing. Every kind of reading has its place. That's why I read books, newspapers, magazines and comic books. It is what I like to read to be either entertained or informed. Well put, Jay, totally agree. Hi, Mark. What an interesting post, and you bring up good points--in a non-scoldy way-- about how authors can contribute toward a more understanding world. I love Hugo and look forward to the new installment! Happy book birthday! I enjoyed THE PARIS LIBRARIAN so I'll be adding THE SORBONNE affair to by TBR pile for sure. I don't get genre snobbery either. A book is good or it's not. Genre has little to do with it. At least for me. I just finished a Helen MacInnes book - RIDE A PALE HORSE. Thanks so much, I hope you like TSA as well. Well I'll be darned. Look who I found first thing this morning - two of my favorite authors just chatting away about Paris, mid-century espionage thrillers, that silly pointless genre snob thing and leather assless chaps. A perfect, PERFECT, way to start my day. Mark Pryor and Hugo Marston are two pretty terrific guys. I have gobbled up the Hugo series, including The Sorbonne Affair which I was lucky enough to receive an advance copy of. I've already told Mark this - it's my favorite installment in the series. I'm going to Paris next month and wishing I could pick up the phone and call Hugo and invite him out for dinner. OH Kaye, I am so jealous. Is this a repeat trip or are you a first-timer? For how long are you staying? And where? Need any recommendations? Can I go to? HAhahaha! SO funny! It's my first visit, Ann. I'm going with three women friends and we've rented a house through Airbnb. We'll be there for a week. I'm going to be blogging about it here at Jungle Red my next Sunday up (9/3). Kaye, oh how I wish I were going with you to Paris. The closer your going gets, the more I wish that I too could fold myself up into your suitcase. How big is that suitcase, Kaye? Pat D - big enough, come on! Ann - We are in Montparnasse, so yes - Left Bank! Well, I wrote a response that disappeared. I'll try again. Happy Publication Day, Mark! I was introduced to your books through this blog a few years ago and have now read all of them. It's always exciting to know that a new one is here! I reread your earlier ones from time to time while waiting for a new one to come out! I grew up reading the mid century spy novels. My dad loved them and would pass them along to me when he finished them. I've been planning to start rereading them. Thank you! I think that's probably a brilliant idea... like telling a kid that the green thing on their plate is made of sugar, not cabbage at all! How funny - although I sometimes find cell phones to be a pain when I'm writing. Too easy to call for help or track someone. Darned technology! Mark , I love this series! And I devoured the mid century spy novels. If only one had time to read every single one of them, over and over! Welcome back to JRW. I remember when you were a guest here several months ago or was it a year ago? I gave your books to a relative for Christmas. He is a fan of Donna Leon and Harlan Coben so I thought he would like your books. Helen McInnes is on my TBR pile. One of these days I will read her books. My great aunt went to the Sorbonne in 1925. She already was a teacher before she went to the Sorbonne. I found her name on a Passenger list leaving France for America in 1925. She gave me a collection of Paris postcards from the 1920s. My grandfather went over to England and France during the First World War. I visited Paris for two and half days as part of a 14 day European tour. it was not enough time to see everything. Look forward to reading The Sorbonne Affair. That's super cool about your great aunt, and you're right about 2 1/2 days not being enough. I've been 17 times and it's not enough! Mark, I love learning about the series and your thoughts about creating characters that perhaps move readers (and the other characters in your books) out of their bubbles. I agree that prompting a conversation is one of the most gratifying things we can do as writers. Generally, it seems that people's bubbles are expanded through personal interaction rather than a political force, and books, and other art forms, can play a role in that. As for the debate between genre and literary, readers are just missing out if they can't get beyond labels! These genre labels don't work too well anyway. I never know where I am going to find a particular author in a bookstore. It seems to depend on who was shelving books that day as to whether it'll be suspense, mystery, romance, literature, etc. Agree on all points, Ingrid. And the wonderful thing is that I've had zero complaints or negativity about Camille. That's heartening. Pat, I've found my books in the oddest places, you're right! I couldn't read about the books too closely in the post, as I have catching up to do. Congratulations on publication day, Mark! Thanks, always a fun day! Thank you, JRW, for another great recommendation! I have somehow missed Mark and his series completely, so I have put The Bookseller on my TBR list. (I always like to go back and start at the beginning -- it's so much more fun to watch series characters evolve over time, I think.) Can't wait for this little virtual visit to France. And I look forward to getting to The Sorbonne Affair in due time, as well. As to the genre snobbery, I think it is so silly! There is much that is sold as "literary fiction" that I find lacking in literary value. And I defy anyone to read a Louise Penny novel (just as one example -- I could name many) and tell me the writing is anything less than literary quality! You're right, I could name dozens of crime writers who are in that literary realm (try Jamie Mason or Tana French, for example). I'm always happy to read a new Hugo story. When I get to The Reluctant Matador I'll be caught up and ready for The Sorbonne Affair. I know. A little bit out of order, but so's life. Hugo is such a nice guy and I think he needs his world to be shaken up from time to time. So, go read a romance, Hugo! I grew up reading Helen MacInnes. I probably swiped the books after Mom read them. I'll make him read a romance in the next book, and I'll tell him you made me do it! I love that your books are so inclusive - especially through Camille. I had a reader shred me for having a character who is a lesbian. She said I was doing it just to be PC and I was so aggravated because that character was shaped by librarians I know and love who happen to be LGBT. I agree with you that we have a responsibility to reflect the world we live in and I just love your Hugo Marston series for doing exactly that. Fascinating interview. Now inspired to start reading a "new" series. Thank you Debs and Mark! Reine, I think you'll really like them. I do recommend starting with The Bookseller! Thanks, Reine, and I agree, I usually suggest people start with The Bookseller. But what do I know?! :o) Hope you like it! That settles it, Mark! The Bookseller first. Thank you! Debs, that's what I'm considering. Good to have your input!